Running Track design is complicated and there are a variety of running track surfaces out there to be considered. Here are a couple of things to consider when looking at renovating or constructing your running track facility. To become a Certified Track Builder by the American Sports Builders Association, you have to go through a five hour exam and meet a certain number of criteria. Certified Track Builders are able to not only construct your track, but to design your track to fit the needs of your facility. Certified Track Builders can design and build track and field elements to fit around your football and/or soccer field, that ensure good flow from event to event and comply with high school and collegiate standards. Often good running track design takes into account concrete curbs, channel drains, proper grades, a high jump pad, pole vault runway and pad and long jump/triple jump runway and pits with takeoff boards. From an architects and engineer’s standpoint, Certified Track Builders are a source for information on budgets, specifications, construction, installation and products in the construction of Tracks. 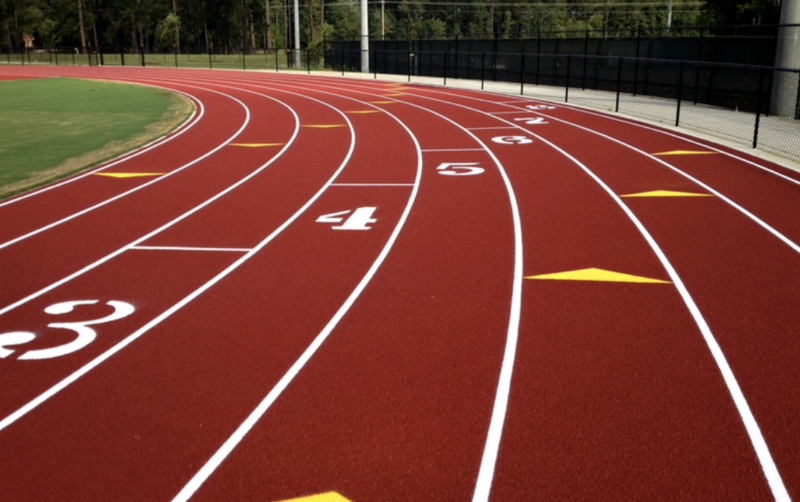 There are two main types of running track surfaces, latex and polyurethane. Polyurethane running tracks are either paved, mixed and poured or a combination of the two. They use polyurethane to bind the rubber particles together and to the asphalt/concrete base. Polyurethane tracks are very high quality and the top performing running track surfaces for athletes available. Many high schools and colleges and recreation areas use them when they need a tough, durable, high-performance surface to withstand high traffic. Basemat System—The Spurtan mat is a binder of fortified SBR rubber that is paved in place and then on top of that can be a variety of surfaces ranging from a structural spray polyurethane surface to a sealed polyurethane spray or even a sandwich system. A sandwich system utilizes a full pour competition layer on top of the basemat to give a depth of the higher end track surface. Full Pour System—The Rekortan line of full pour systems range in thickness and layer composition. These systems start at 10mm and go up to 15mm depending on surface option and the use of the surface. Are you considering renovating or constructing your running track facility? Click here to visit our website for more information or click here to sign up for a track facility assessment.